Born in Karitza, Greece in 1938 and knowing only two words in English (good luck), Peter Tountas immigrated to the United States at the age of 12, first living in Hammond, Ind., and later settling in Tucson. Pete has amassed many local, state and national bowling honors, including three Professional Bowlers Association championships over a career of 36 years. He won the ABC Masters in 1968 with a 40-game average of 220, and at one time his record of a 219 average spanned 204 games. He is a Hall of Fame member of the Tucson Bowling Association, Arizona State Bowling Association and the prestigious American Bowling Congress. With three perfect games to his credit, he also is an avid golfer with a low handicap. He has had two holes-in-one. Pete’s devotion to bowling and various youth programs, along with having hosted two WIBC tournaments, has earned him well-deserved recognition as an authority in this sport. He also has hosted the National Professional Bowling tour for over two decades. 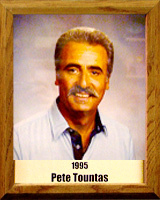 A long-time manager of Golden Pin Lanes, Pete has served as chairman of the prestigious Greek Festival several times.